Even if you have some stubborn branches, Bosch have you covered. Model Bosch AHS 70-34 hedge trimmer is a superb choice if you are on the market, for a really good machine. The cutting performance is great. On one side, the 700 watt powerful motor, is plenty for anything you can through at it. On the other hand, the 70cm long, diamond cut blade. This blade is amazing. It cuts right through branches up to 34mm. That is the tooth spacing of the blade. Speaking of the blade, it also features a sawing function. This will help you tackle branches that are wider than the specified tooth spacing. So, more or less, whatever your case is, you are covered. It also has a metal tip, which means you won’t ruin your blade if you hit the wall behind your hedge. The trimmer is very easy to handle as well. It is just 3.8kg. Combined with the low weight, the soft grip handles give you a secure grip and won’t leave you fatigued after a while. This version of the trimmer, is actually 15% lighter than the previous. It might seem like a small change, but rest assure it is quite noticeable. Multi-start buttons are also available, which means you can work in different positions, without any problem starting the trimmer. 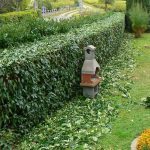 If you have read some of our posts here at best hedge trimmers, you will probably notice that we have lots of Bosch products. 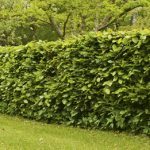 The reason for this is native and simple: they build high quality hedge cutters that perform and last long. Bosch AHS 70-34 is not an objection. Bosch Ahs 70-34 is comparatively lightweight for a product from this class. The handle is ergonomically designed and soft. The general weight of this trimmer has been carefully balanced in order to make Ahs 70-34 as manoeuvrable as possible. 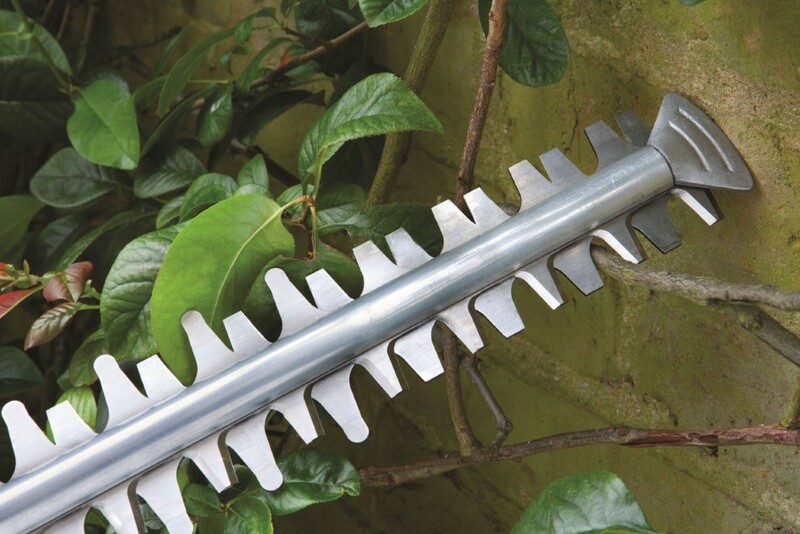 The 700 mm laser-cut, diamond-ground blade, makes it easy to reach and trim tall or deep hedges, and to reach “unreachable” branches in strange positions. This electric hedge trimmer is designed for large hedges and thicker branches. 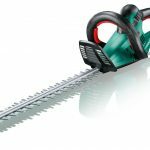 Bosch Ahs 70-34 long blade makes it easy to trim large gardens. The performance of this electric hedge cutter is also great. 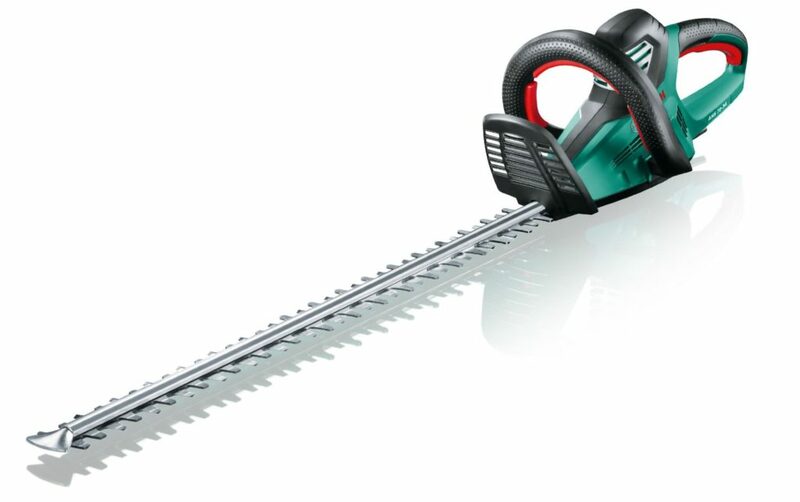 Bosch Ahs 70-34 has sawing function on the blade, helping to cut larger branches. The motor is powerful enough – 700 watt. Tooth space: 34mm, designed to cut large branches. 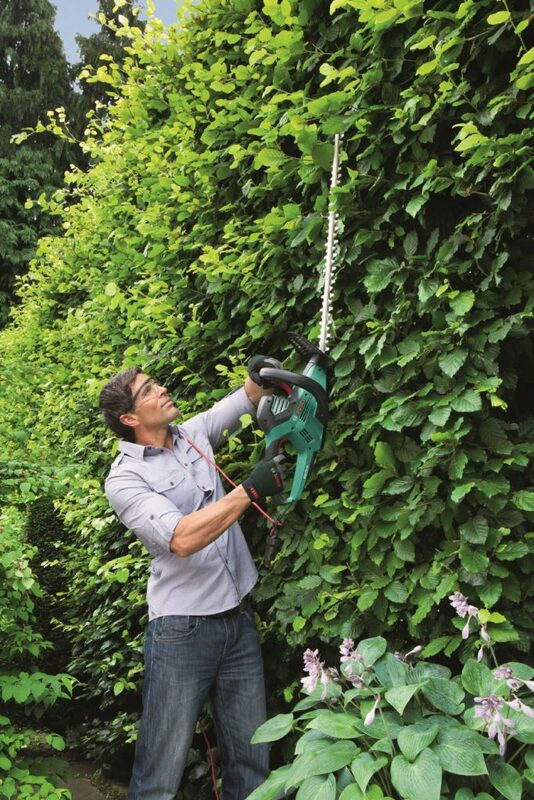 Sawing function: This cool feature of Bosch Ahs 70-34, allows its owners to cut even larger branches – up to 38mm. 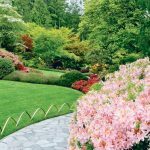 Designed for large hedges and thick branches. Dealing with larger branches is not a problem. It has “Softstart” to reduce kickback. Large tooth spacing and large tooth opening. The handle is multi-switch. This provides comfortable usage in different working positions. Blade cover is included in the package for safe storage. The only one disadvantage for this cutter is linked to the extended use. It could become heavy for some users after a long trimming. Bosch really tried to conquer the market with their great variety of electric hedge cutters. 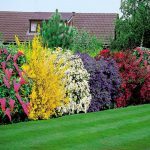 They have developed a large range, covering from small to large hedges. Basically is should suit everyone. In the same category “Electric hedge cutters” we reviewed Bosch Ahs 65-34. This Ahs 70-34 model is larger, more powerful. It is also known as “The Big Daddy” of Bosch electric hedge cutters. Thanks to its long blade, Bosch Ahs 70-34 is providing light work even for big, thick branches and dense hedge. Spacing between teeth: 34 mm. I have been using Bosch products for some time now, so it was a no brainer to buy a Bosch trimmer. I can say without any doubt, this one is excellent. It goes through my hedge with such ease. I was actually surprised. Feels well in the hand, and I don’t feel that my hand will slip, even when I hold it in an odd position. Not to heavy too, so I can use it for longer. My hedge is about 2 metres high. I had a Bosch trimmer before, which failed partly because of me. Aside from that, I really liked it, so I decided to go Bosch again. Definitely don’t regret my decision. This is such a great machine. I’ve been borrowing some other trimmers but they just didn’t do it for me. This one is way higher quality. Definitely would recommend. I am very pleased with the performance of this trimmer. It goes through stems up to 2cm with no problems. This actually replaced my petrol cutter, which has heavy and uncomfortable to use for a long time. Bought this to replace my old trimmer. My old one did its job, but my hedges were getting quite big, and it could really keep up. This Bosch one though, it just work so good. I am very pleased. The long blade is so useful I love it. It makes clean cuts and saves me quite a lot of time. It is surprising how much power there is in this quite light trimmer. This is an excellent product from Bosch. 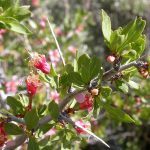 I was worried that it might not be that great for larger branches, but it just doesn’t care. It goes through everything I throw at it. The quality of the trimmer is great and the balance is very nice. I don’t feel that it will slip out of my hand at all. Very good product, and excellent purchase. If you interested, here you can find the user manual for Bosch AHS 70-34 trimmer. Cost and discounts for Bosch AHS 70-34 may vary depending on the season and where you buy it. 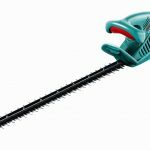 It is better to compare price at different websites before buying this electric hedge cutter. The price is around 160 GBP. 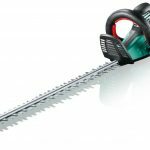 Our team at hedge trimmer reviews advice to buy from Amazon. It is the best online retailer to buy from. They are trusted and safe. Get this electric hedge trimmer if want a powerful machine that delivers a great job. 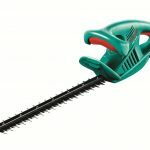 Bosch AHS 70-34 is an excellent product, that makes tree and hedge trimming so easy.